If you go to the Projects area you will notice there are several views you can choose from. 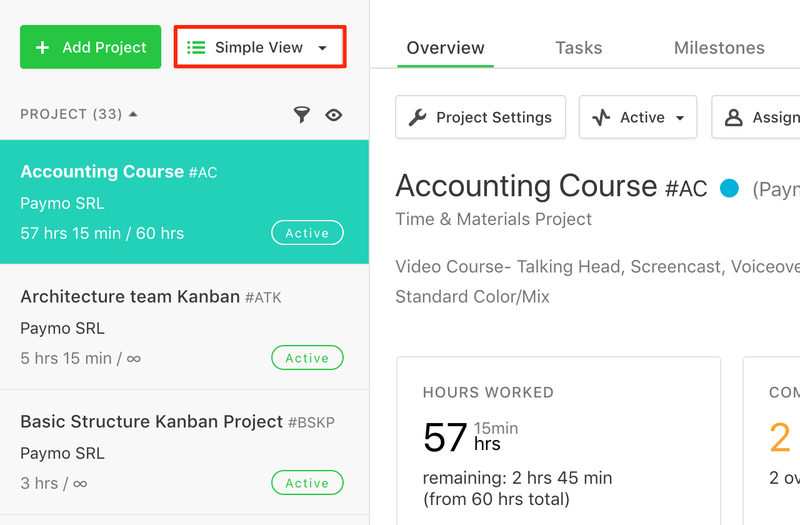 Using the Simple view gets you quick access to the project overview. They’re displayed by default in alphabetical order and if you wish to easily find specific projects you can use the filter option. By clicking on the Show icon (eye icon) you can toggle between seeing Active or archived projects. By switching to Table view you’re able to sort and filter projects by the desired column. If you want to display/hide more columns you need to click on the Columns dropdown menu on the top right corner. You can see how many tasks were completed, the work progress, set budgets etc.